Just two months ago I wrote about Wisconsin Governor Scott Walker's dual attacks on his state's flagship university. Walker, who is currently running for the Republican nomination for President, is moving to eliminate tenure for professors at the University of Wisconsin, while at the same time implementing an enormous $250 million budget cut. This week we learned a new reason why Gov. Walker cut that $250 million: he wants to give it to wealthy hedge fund managers to build a new basketball arena for the Milwaukee Bucks. No kidding. I can only imagine what my colleagues at the University of Wisconsin are thinking. 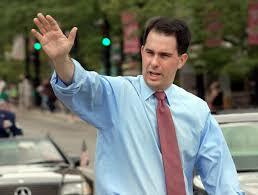 On Wednesday, Walker signed a bill that would spend $250 million of taxpayers' money to build the new arena. Last year, the team was purchased by two billionaire hedge fund managers, Marc Lasry and Wesley Edens. In what's become a standard ploy, the new owners threatened to move the team if they didn't get a new arena. The libertarian Cato Institute denounced the public financing of the arena, according to the New York Times. Other Republicans are furious with Walker because one of the team's co-owners (Lasry) is a major supporter of Hillary Clinton's campaign. When I wrote about Walker's attacks on the University of Wisconsin in June, I was mystified by why he would go on the offensive against an institution that his state should be incredibly proud of–and that provides countless benefits to the state and the nation. It seemed petty and vindictive, and it still does. But the money cut from the University of Wisconsin, $250 million, exactly matches the state's contribution to the new arena for the billionaire hedge fund owners of the Milwaukee Bucks. It's now obvious what Scott Walker's priorities are.